The most commonly broken bone in motocross is the collarbone. Medical sources claim that it only takes 7 pounds of pressure to break it. Collarbones are usually broken by falling on the point of the shoulder, impacting the ground with your upper torso or hitting the ground hard with one arm above your head. The most obvious symptom is a broken bone, but that is not readily discernible without an X-ray. Here is a list of symptoms that should lead you to suspect a broken collarbone. 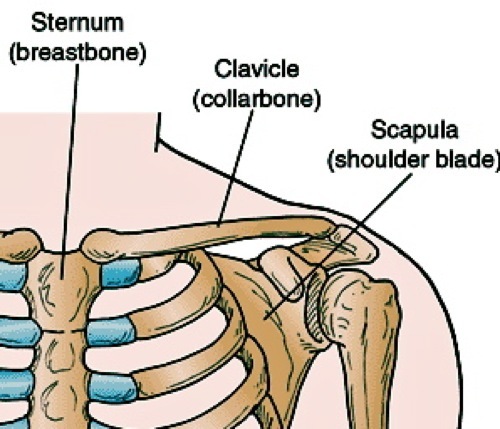 Pain: A broken collarbone most often causes immediate pain in the area of the break. Sound: Some people report hearing a snapping sound. Arm-hang: Most people tend to hold their arm close to their body and support it with their other hand. Despite the pain, some people, particularly younger athletes, can have a surprising range of arm motion following a break. Slump: The shoulder of the affected side is usually slumped down and forward due to gravity. Bulge: The skin over the break often bulges outward and can be a reddish-purple discoloration, indicating early bruising. ONCE IT’S BROKEN, WHAT IS THE NEXT STEP? Most broken collarbones heal well without surgery. A simple arm sling can usually be used to immobilize the arm. A child may have to wear the sling for three to four weeks; an adult may have to wear it for six to eight weeks. Depending on the location of the break, your physician may apply a figure-eight strap to help maintain shoulder position. This sometimes entails him putting his knee in your back and tugging. If that fails, he might suggest surgery to pin the bones. You may fear surgery, but overlapping collarbones can cause serious biomechanical maladjustments, which could affect your strength and range of motion. The surgery consists of using screws and a metal plate to reattach the bones. It leaves a scar and a lump?not attractive, but fully functional in time. Given our druthers, we’d prefer to have the bones heal sans nuts and bolts. Listen to your doctor; get a second opinion if you have doubts, but do everything in your power to get the bones to line up properly. HOW LONG DOES A COLLARBONE TAKE TO HEAL? That depends. A crack will heal faster than a break. A young rider will heal faster than an older one. Perfectly aligned ends heal faster than misaligned ones. So, how long will it take to heal? Six weeks is the standard answer, but the calcium bridge is the real answer. What is the calcium bridge? During the healing process, typically from three to five weeks, the body produces calcium. It is what glues the broken pieces back together. The calcium bridge can be seen on the X-ray, and the doctor can tell from the density of the film the progress of the healing. The MXA wrecking crew can’t fix your collarbone for you, but here are some tips we’ve learned through experience. Collarbone bra: We suggest that you wear the shoulder brace. The brace is meant to hold the bones in the best position to heal?not just heal properly, but heal faster (by narrowing the gap the calcium bridge has to span). Rush to weakness: Don’t rush back into action. Let it heal! If you continue to move the mushy calcium around before it has had time to calcify, it will never truly heal. Take the radiation: Always insist that the doctor take an X-ray before releasing you to race again. It is possible to feel strong, have excellent mobility and believe that you are healed when you are not. Go to the gym: Ever heard of the dumbbell shrug? Once your doctor clears you, get to the gym and start working out. Start with no weight (just the bar) and do dumbbell shrugs?upright rows and behind-the-neck presses. Start slowly and work your way from light weights to heavier weights.